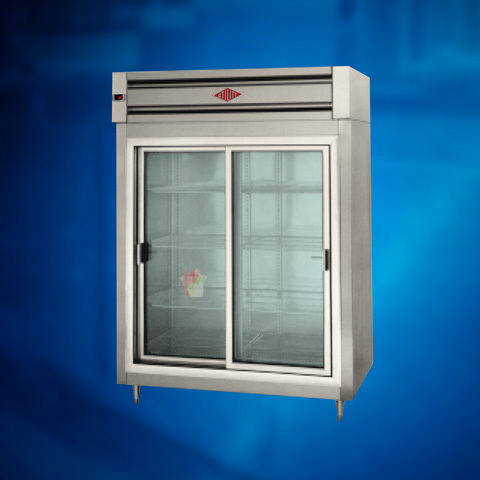 Glass doors have two panes and magnetic gaskets for maximum refrigeration efficiency. 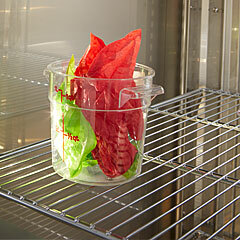 The optional heated glass prevents condensation in humid environments. Door perimeters have built-in energy saving condensate heaters. 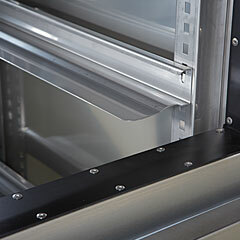 Doors are equipped with self-closing lift-off cam hinges with stay open feature at 120 degrees. Standard door hinging is door hinged right (other configurations available; please specify). Top-mounted fully hermetic compressor with R-404a refrigerant. Thermostatic expansion valve for superior performance and efficiency, faster temperature recovery, less running time and lower energy consumption. Hot gas condensate evaporator on units equipped with top-mount coil (units with ceiling-mounted coil have electric condensate evaporator). Pressure control prevents compressor burnout in case of loss of refrigerant. Easy-to-use digital temp. control enables users to adjust setpoint between 35-40 degrees F.